BEERSHEBA, Israel (AP)—Israel deployed a cutting-edge rocket defense system on Sunday, rolling out the latest tool in its arsenal to stop a recent spike in attacks from the neighboring Gaza Strip. Israel hopes the homegrown Iron Dome system will provide increased security to its citizens, but officials warned that it can’t do the job alone. The system went into operation shortly after an Israeli aircraft struck a group of militants in Gaza, killing two. Israeli said they were about to fire a rocket. 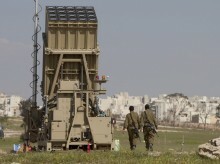 The Iron Dome system has raised hopes that Israel has finally found a solution to the years of rocket fire from Gaza. The primitive rockets have evaded Israel’s high-tech weaponry, in part because their short flight path, just a few seconds, makes them hard to track. The government approved Iron Dome in 2007. Its developers have compared the effort to a high-tech start-up, working around the clock in small teams to perfect its weapons, radar and software systems. The developer, local defense contractor Rafael, declared the system ready for use last year. Iron Dome uses sophisticated cameras and radar to track incoming rockets, determine where they will land, and intercept and destroy them far from their targets. If the system determines the rocket is headed to an open area where casualties are unlikely, it can allow the weapon to explode on the ground. Brig. Gen. Doron Gavish, commander of Israel’s air defense corps, said Iron Dome has passed a series of tests and has now reached its “evaluation phase” in the field. It is expected to be fully operational in a matter of months. He added that it was only supposed to be deployed later in the year, but it was put into operation earlier because of the recent rocket attacks from Gaza. “Obviously, after what we saw in the last few weeks, we accelerated the phases,” he said, standing before the brown, box-like battery on the outskirts of Beersheba, southern Israel’s largest city with a population of nearly 200,000. After two years of relative calm, tensions along the Israel-Gaza border have heated up in recent weeks with Gaza militants firing deeper and more frequently into Israel, and the military striking back hard. Beersheba, more than 25 miles (40 kilometers) from Gaza, has been struck several times. Although Israel and Gaza’s ruling Hamas militant group have both said they have no interest in escalating the situation, the renewed hostilities have fed concerns of another large-scale Israeli military operation. In December 2008, Israel invaded Gaza in response to years of rocket and mortar barrages on its southern communities, killing 1,400 Palestinians, including more than 900 civilians, and causing widespread destruction. Thirteen Israelis also died. Israel believes that Hamas, which suffered heavy losses in the fighting, has recovered from the fighting and restocked its arsenal with more powerful weapons. Gaza militants, including Islamic Jihad and Hamas, said over the weekend that they would halt their fire if Israel did. But early Sunday, Israeli aircraft struck a Palestinian rocket squad in the Gaza Strip, killing two militants from Islamic Jihad, a smaller rival of Hamas. It was not clear whether Islamic Jihad was reneging on its commitment to the cease-fire, or whether the airstrike hit a rogue group of militants. Hamas government spokesman Taher Nunu urged all militant factions to halt their fire as agreed. Israeli Prime Minister Benjamin Netanyahu said Israel had “no interest” in escalating things. “But we won’t hesitate to employ the might of the military against those who would attack our citizens,” Netanyahu told his Cabinet. Netanyahu also gave a sober assessment of Iron Dome, saying he “didn’t want to create the illusion” that the system would offer Israel 100 percent protection from rocket attacks. “The Iron Dome system is still in an experimental stage, and at any rate, we cannot deploy batteries that can protect every house, every school, every (military) base and every facility,” he said. A second anti-missile battery will be deployed in another large southern city, Ashdod, the military said, without specifying a date. Officials refused to say how many batteries would be deployed altogether, what their range was, or how much the system would cost. Analysts have estimated the cost of shooting down a rocket could be tens of thousands of dollars, compared to just a few hundred dollars to produce the rocket. “The real test is not the price of knocking down the rocket, but how much damage the rocket would cause, and the price in human life, if it hits,” said Gavish, the air force officer. Uzi Rubin, an Israeli missile defense expert, said the system is bound to suffer initial malfunctions as operators learn how to use it. “Unfortunately, Israel is writing the book,” Rubin said. “That includes doing some things right and sometimes making some mistakes.